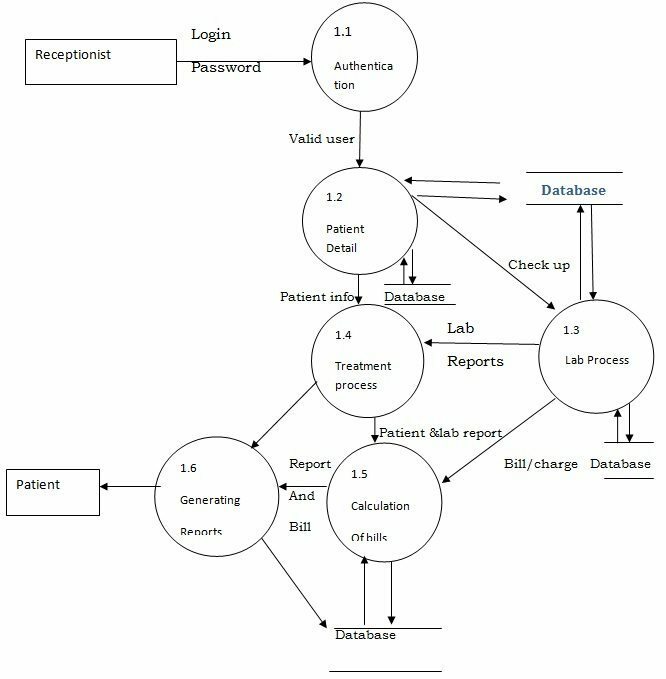 This page contains System analysis design of hospital management system. The purpose of design phase is to plan a solution for problem specified by the requirements. System design aims to identify the modules that should be in the system, the specification of those modules and how they interact with each other to produce the result. The goal of the design process is to produce a model or representation of a system can be used later to build that system. The produced model is called design of the system. As the project is user friendly, it can be applied to large database with more information. This software can be used by hospital management to make the work simple. They can get information quickly as possible. It can handle large volume of data and present the report whenever required. In this project, we use SRS as the applicable document. Administrator can view all the details of the hospital record. This module is used to store details of patients who are admitted. The outpatient module contains details of the patient who are came for check_ups. Lab module is used to generate laboratory reports. Billing module is used to calculate the bill of the patient. 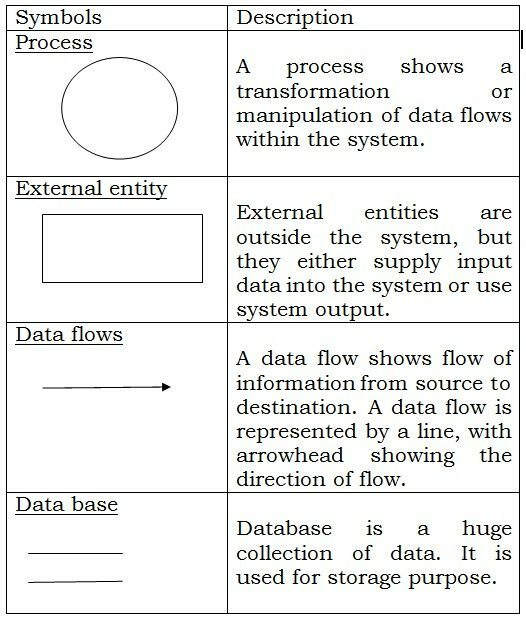 A context flow diagram is a 0th level DFD.It only contains one process node that generalizes the functions of the entire system in relationship to external entities. Output:-If login is successful then administrator can view and update the records. Process Definition: – Information about the treatment given to the patients who are admitted. Output: – Information about the patient. 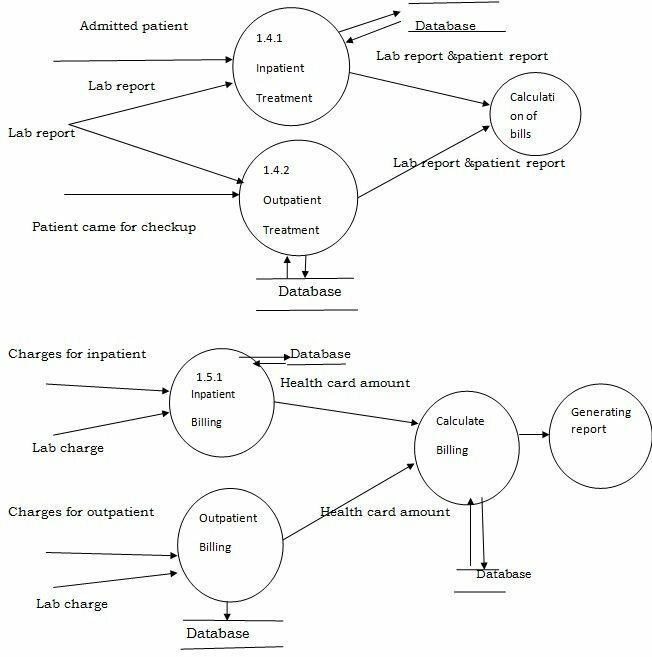 Interface with other module: – The inpatient details are necessary for lab reports and billing. Process Definition: – This module has the information about the treatment given to the patient who are came to check up. 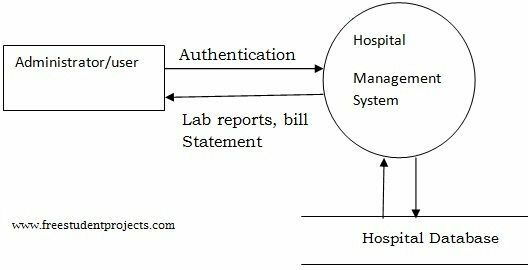 Interface with other module: – The outpatient details are necessary for lab reports and billing. Process Definition:-Laboratory reports of the patient. Output: – Lab report and charge. Interface with other module: – This module requires information from inpatient and outpatient modules. Process Definition:-Calculates bill and deduct amount if any card facility is available.  Interface with other module: – Billing module requires information from inpatient and outpatient modules.